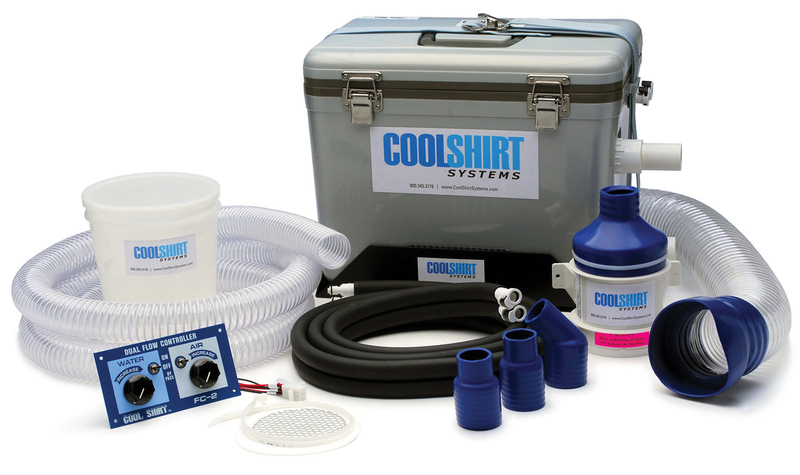 Summit Racing now carries Cool Shirt Personal Cooling Systems. A Cool Shirt is layered with tubing that circulates temperature-controlled cool water around the user's torso from an ice-filled base unit, stabilizing body core temperature, reducing heat stress, and preventing dehydration. 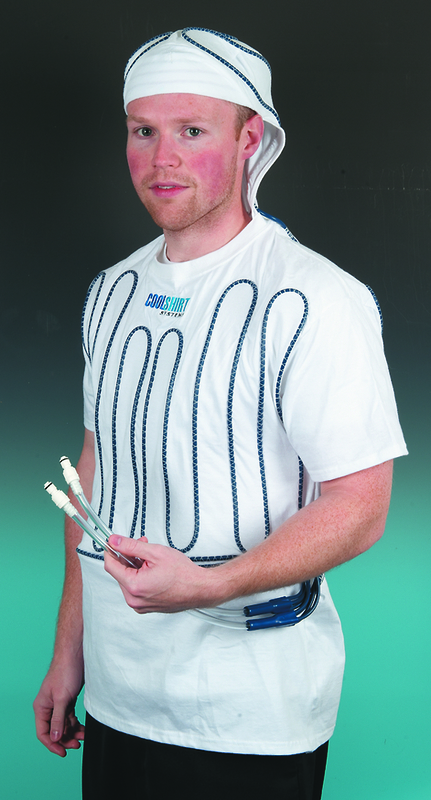 Summit Racing now carries Cool Shirt Personal Cooling Systems. A Cool Shirt is layered with tubing that circulates temperature-controlled cool water around the user's torso from an ice-filled base unit, stabilizing body core temperature, reducing heat stress, and preventing dehydration. Staying cool reduces the chances of losing a race or making an error. These shirts features sewn-in, non-kink tubing that supplies consistent, continual cooling to the wearer’s torso from a Cool Shirt base unit. The shirt fabric is moisture-wicking, provides anti-microbial protection, and won’t shrink or fade. Available in men’s X-small, small, medium, large, X-large, 2X-large, and 3X-large. The compact Club System is ideal for short-duration competition like drag racing or autocross. The base unit has an internal pump which supplies cooled water to a Cool Shirt through double insulated hose with automatic shutoff/quick disconnects. The Club System is available with a 12 quart or 24 quart capacity unit. Hose is not included, but is available at Summit Racing. The Pro Air and Water System idelivers temperature-controlled cooled water to the driver’s Cool Shirt, plus cooled HEPA-4 filtered air to their helmet via a 235 cfm blower. The base unit holds 12 quarts of water and has an internal pump to circulate water through the Cool Shirt. A dual temperature control switch allows the user to regulate the flow and the temperature of water based on external temperature variation. Eight feet of double insulated water hose with automatic shutoff/quick disconnects is included to attach the cooling unit to the Cool Shirt. 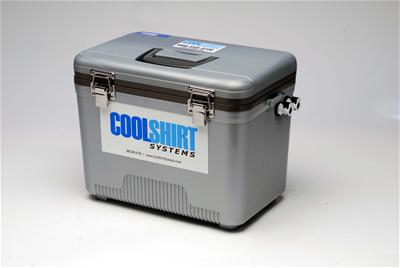 Use a Cool Shirt to keep cool in the pits or a home shop by attaching it to the Back Pack Cooler System. 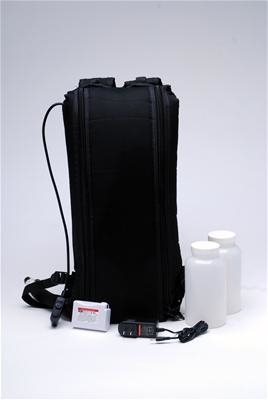 The lightweight backpack-style system can be worn over a Cool Shirt or other clothing; the battery-powered 7.4V pump can circulate cool water for up to two hours before the user needs to add ice. The Back Pack Cooler System comes with a rechargeable lithium-ion battery pack, recharger, and two ice bottles. Summit Racing also carries other Cool Shirt cooling systems plus vests, hose, drain kits, base unit mounting brackets, and other accessories.